In this month’s issue of Physics World, an international group of researchers propose a new technology that could divert vibrations away from load-bearing elements of bridges to avoid catastrophic collapses. Michele Brun, Alexander Movchan, Ian Jones and Ross McPhedran describe a “wave bypass” technique that has many similarities to those being used by researchers looking to create Harry Potter-style invisibility cloaks, which exploit man-made materials known as metamaterials to bend light around objects. Led by Movchan, who is at the University of Liverpool, the researchers propose making “lightweight changes” to existing bridges by bolting on special lightweight structures at period intervals to the underside of the main “deck” of the bridge. These structures would consist of concentrated cubic blocks, or resonators, linked to each other, and the bridge, by a series of bars. 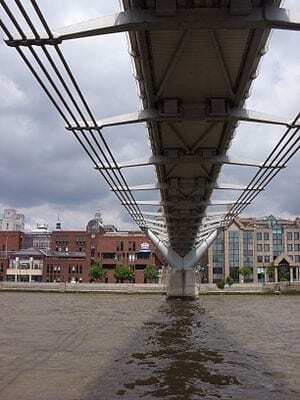 The resonators, appearing under the bridge like a set of hanging baskets, could be fine-tuned to the specific vibrations that make a bridge susceptible to collapsing, meaning the vibrations get redirected into the resonators and make the bridge safer. The Tacoma Narrows Bridge is perhaps the most famous example of a bridge that collapsed in response to external forces. In 1940 strong rhythmic cross-winds resonated with the bridge’s natural frequency, causing it to bend and twist until it collapsed. Although 21st-century structures are much more robust, the researchers’ proposals have been inspired by events on the Volga Bridge two years ago. The 7.1 km bridge, which crosses the river Volga in Russia, was forced to shut in May 2011 – less than a year after opening – when a long-wavelength resonance vibration caused sections of the bridge to bend. A similar problem struck the Millennium Bridge in London when it first opened in 2000. “Even though the Volga and Millennium bridges were designed using industry-standard packages, the fact that problems arose shows that it is all too easy with large and complicated structures to overlook vibrations that may cause structural problems under practical conditions,” the researchers write.